So let’s talk housekeeping first, and no, I’m not talking about the vacuuming, the dusting and the ironing. It’s CookSister housekeeping (which is a lot more fun anyway!). H2ope for Haiti update – and an extension! As you are now by all aware, the H2Ope for Haiti charity raffle is well underway. Thanks to your enthusiastic Tweeting, Facebooking, blogging and ticket buying, so far we have raised just over £700 in less than a week, which is a phenomenal effort! Thank you very, very much – the generosity of the food blogging community continues to amaze me. And to give you even more chance to bid on our 35 fabulous prizes (Virgin and Amazon vouchers; signed cookbooks from David Lebovitz, Nicole Stich, Skye Gyngell and Raghavan Iyer; original art; Belgian chocolates; and even an iPod) we have decided to extend the closing date to midnight GMT on Sunday 7 March! There are still a couple of prizes with NO BIDS YET where you will have a 100% chance of winning – so please do buy a ticket. 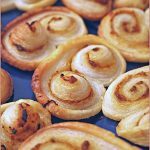 My Google Anayltics tells me that one of the best-loved and most visited pages on this blog is my comrehensive recipe index. What started out a couple of years ago as a list of recipes that would hardly have covered both sides of an A4 page, as slowly grown into a behemoth that had become difficult to navigate and not very user-friendly. So I have given it a little bit of a facelift and made things easier for you, dear reader, by adding bookmarks within the page – you can skip from the heading “Main course – Seafood” directly to that section of the index – no more frantic scrolling! And while I was at it, I also gave my Ask Cooksister page the same treatment – so now you will be able to find the answers I have given to people’s culinary questions far more easily. Meet the new Food24 foodie travel expert! As my regular readers will recall, for the last year I have written a regular fortnightly column for the popular Food24 website. Although that has now come to an end (and I am available to look at other freelance work, hint hint! ), I have taken up a new position at Food24 as their foodie travel expert. Need to know where to eat on a budget in london, how to avoid ordering calf’s brain on a French menu, or what hush puppies are on a menu in Atlanta – feel free to ask! And now let’s talk husbands. Don’t you love it when they surprise you? No, I’m not talking about something sparkly in the bottom of my champagne glass on our anniversary. Or finding plane tickets to the Bahamas under the pristine white cloth on my breakfast tray. Or even having a breakfast tray brought to me in bed! No, I’m talking about the scenario where I plan to hole up in the study all weekend and edit photos and text for H2ope for Haiti so I can get the raffle underway on time. And then my dear husband surprises me by telling me some of his touch rugby team are coming over for a bit of a kick-about in the park… and dinner at ours. Surprise!! To his credit, he did do most of the cooking (on the braai, while the rest of us stayed indoors near the heater!! ), but he had not bought any crisps or snacks, and people were getting hungry. These emergency crostini were put together at short notice from what I could find in the cupboard and freezer – a small baguette, some sun-dried tomato pesto, and olives left over from my salmon with smashed olives. They were delicious and neatly filled the gap between drinks and dinner – emergency averted! Slice the baguette into 1cm thick slices. Brush each with a little olive oil. Place on a baking sheet under a medium grill and toast until golden and crisp. While they are toasting, slice each olive into 3 or 4 slices. Remve bread from the oven and allow to cool a little. 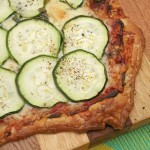 Spread each slice with a generous amount of pesto and top with a couple of olive slices. Serve garnished with chopped parsley. « Food Journeys of a Lifetime – want to win this book? I’ve had sun-dried tomatoes and olives but never thought to use them in a canape. I will remedy this. These look fantastic, Jeanne! I’m going to make them for a spa party I’m attending later today. Thanks for the inspiration! Delicious looking! Beats tired old chips & dip any day. These look fantastic – like little frogs staring at you!!! 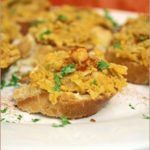 Fab crostini! I love tomato pesto/tomato tapenade (as they consider it here in France). Great recipe once again!